Foundation movement has caused problems for North Texas home owners since the introduction of slab-on-grade foundations in the 1940’s. The engineering of these foundations was improved with the addition of interior grade beams and post-tensioned cables. These enhancements have lead to the current industry standard Post Tensioned Slab. Even with this improved engineering, the expansive soils that are found in North Central Texas can cause foundation problems for home owners if their foundation is not properly maintained. People moving from other parts of the country have never even heard of the concept but… Watering Your Foundation ~ It’s A Texas Thing!!! Now imagine your house sitting on that sponge. A clay type soil will increase in volume both horizontally and vertically when it’s moisture content increases. The same soil will shrink in all directions when the moisture content decreases and the soil dries. While there are variations in the expansiveness of clay soils, most clay soils in North Central Texas are of the type that have a moderate to high expansion rate. If the soil under your house isn’t evenly hydrated the foundation will not have a flat surface to rest on causing it to crack and jeopardize the integrity of your entire home. Typically, it is difficult for all areas of a foundation to be at a constant moisture content because the foundation itself provides a shelter from weather conditions that effect the soil underneath it. The moisture change at the perimeter of the house, however, is more rapid due to it’s exposure to the drying and wetting effects of rainfall and evaporation. As the soil under your home shrinks and swells, the post tensioned slab it sits on is designed to float up and down without failing. As long as the movement doesn’t damage the house, it’s not a problem. Plumbing problems under the foundation can also be disastrous. The water from broken or leaking water lines, leakage from a swimming pool or a broken sprinkler system can also lead to soil being hydrated unevenly and causing the soil on one side of the home to swell and unevenly lift the house. Left unattended, these maintenance issues lead to foundation problems that compound and manifest themselves in doors and windows that will not open, cracks in tile and other flooring or cracks in drywall at corners, windows and doorways. 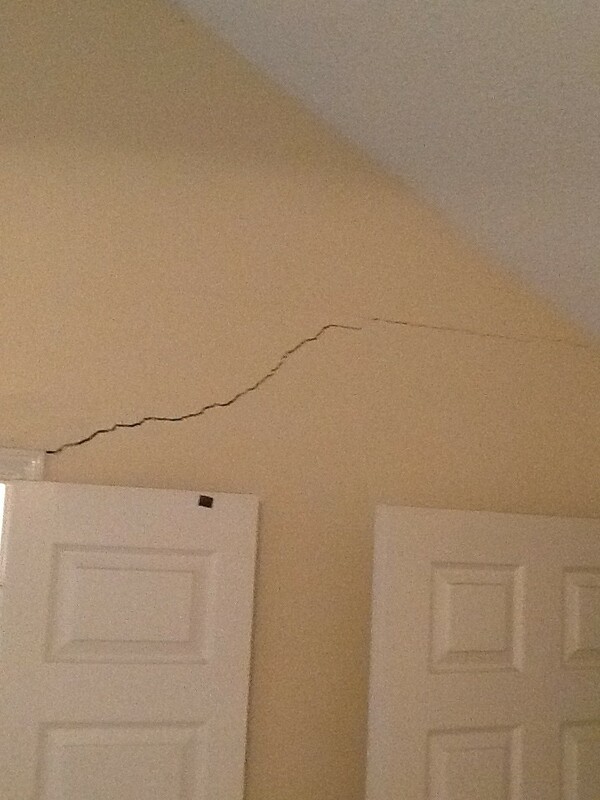 So how do we maintain the foundation of our home to avoid these problems? Maintaining good drainage is often a forgotten aspect of home maintenance but it is essential in order to prevent areas of water accumulation that will result in damaging differential swell of the clay soil. Make sure that the soil around your foundation is graded to shed water away from the foundation. The recommended grade is for the soil to drop four to six inches in four to six feet. Avoid trapping water against your foundation. Water can be trapped against your foundation by a raised flower bed, metal landscape edging, sidewalks or other obstructions. Use downspout extensions or splash blocks on all of your down spouts or route water from gutters and down spouts away from the foundation using underground drainage. Make sure that all paved surfaces that surround your home slope away from your foundation. This is especially important for decks and sidewalks around swimming pools. If your sewer becomes blocked or backs up have it tested for leaks. Many times sewer blockages are caused by roots which means there is a leak in the sewer line. Leaking sprinkler lines and swimming pool plumbing can also cause swelling on one side of the foundation and needs to be addressed immediately. Keep the soil around your foundation two to four inches below the brick line or the edge of the siding. Infiltration of moisture and fine soil into the home and the insulation material may occur if the soil is above this level. Keep the majority of shrubs around your home under three feet tall. Large plants need large amounts of water and can cause rapid drying of the soil. If you have large trees around your home and the trees are closer to the home than the height of the tree, consider installing root a root barrier to prevent the root system from pulling water from under the foundation. That’s right… Water Your Foundation! I needed more than 50′ of hose to get around the house so I bought more hose and added on. Even though the ground was relatively level, the majority of the water came out near the timer just like he said in the video and I didn’t get good results at the far end of the 100′ length of hose. The soaker hose was also in the way when I mowed. Seems pretty simple… just push it up against the house when you mow and pull it back out away from the house when you’re done. That worked for about the first couple of times and then I just started mowing over it… Until I cut it into shreds. I bought a new soaker hose… from then on the soaker hose stayed up against the house… Exactly where it is NOT supposed to be. Even with the hose next to the house the weed-eater cut it. This was easier to fix with a hose coupler but it took two trips to the store because soaker hoses are a smaller diameter than a regular hose. Today I had Felix Brito with #1 Ave Irrigation and Fence Co install an underground foundation drip irrigation system. When we called Felix for an estimate he answered his phone and immediately set up an appointment to come by. He is very easy to talk to and communicates well with his clients. The forecast for the day we had scheduled for him to install the system called for rain and we weren’t left guessing. Felix called the afternoon before our scheduled date to reschedule. He arrived to install the system on time with a very polite and hard working crew. He provided a detailed Scope of Work letter to ensure that the work he had planned was exactly what we were expecting and he had a simple clearly written contract for both of us to sign. This underground foundation drip irrigation system uses Rainbird “Coppershield” drip tubing with emitters every 12″ that put out 0.6 gallons per hour (GPH). Felix placed the tubing all the way around the house 8″ away from the foundation and about 4″ deep into the soil. He also installed a new sprinkler valve, filter and pressure regulator and connected it to the controller for the rest of the sprinkler system. I highly recommend calling Felix Brito and letting him give you an estimate for a foundation drip irrigation system. I haven’t personally seen his concrete or fence work but when I need some done I’ll certainly give him a call! What About the Watering Restrictions? Foundations, new landscaping, new plantings (first year) of shrubs, and trees may be watered for up to 2 hours on any day by a hand-held hose, a soaker hose, or a dedicated zone using a drip irrigation system. Customers should check with their city for specific regulations. It is, of course, necessary to water more during hot, dry weather and less during cold, damp weather. The amount of water required to keep a foundation stable during the drought can be surprisingly large because trees, shrubs and other plants also remove large quantities of water. During persistent hot dry weather, it may be necessary to water a foundation daily. Your foundation watering program should supply enough water to keep the moisture content in the soil under the foundation of your home at a consistent level. An attempt was made to request data that is not available to the key that was used to authenticate the request.API Error ID: 8B931CCAAB0C45E0BC98439A0C337209 The API says: [The API key you supplied is not enabled] While attempting request to (https://api.wolfnet.com/core/auth).